Advanced Living Home Services (ALHS) is a closely related non-medical home care agency delivering quality supports and services to our senior residents as well as to seniors and younger disabled individuals in homes and community dwellings throughout Montgomery County- and beyond. Advanced Living services range from personal care to homemaker to comforting companion. Our trained caregivers provide safe, round-trip transportation to medical appointments as well as shopping and to other social outings or desired destinations. Advanced Living clients receive medication reminders, meal preparation, and light and heavy cleaning. We start with a comprehensive assessment of need and client preference-including a full home safety assessment-and from there build an individualized plan of care. Excellent care starts with our staff. 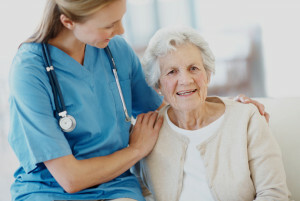 Advanced Living caregivers are known for their highly reliable service and compassionate care. All caregiver staff undergo regular background checks, and receive annual training sponsored by the Pennsylvania Department of Aging. In fact, over 95% of Advanced Living clients would recommend us to others, and would use us if they needed home care services again! Advanced Living believes in upholding a new standard of aging-in-place based on strengths rather than allowing our residents and community-dwelling clients to succumb to a loss of independence. Most seniors prefer to remain in their own residence as long as possible, and are able to manage quite well if they receive the kind of personal care and assistance delivered by Advanced Living. Please call 215-362-0227 (Ext. 143) for more information and a free, confidential consultation! Advanced Living Home Services is licensed by the Pennsylvania Department of Health and an approved Medicaid waiver provider for the Pennsylvania Office on Long Term Living. We are also an approved Options provider for the Montgomery County Office of Aging and Adult Services.